1. If you were a tv show, what tv show would you be? Six Feet Under. I am fascinated by life and death, as this show was as well. I tend to be a realist and SFU dealt with things realistically, not in a sugar-coated, wrapped up in a pretty bow way like a lot of programs tend to do. 2. If you were a dog, what kind of dog would you be? 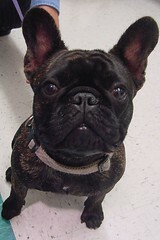 According an online quiz I've done, a French Bulldog. I've done it more than once and always come out the same. Funny thing is, I happened to meet a cute French Bulldog puppy in Michael's Wednesday evening. Her name is Bella. If I got to choose though, I'd be a mutt that looked like Little Guy with Rusty's personality and Cosette's intelligence. 3. If you find these questions as silly as I do then tell me. I see you bought a book about skepticism, tell me one thing you are skeptical about. The questions are silly, but fun. Fun is good. I'm skeptical about lots of things. Some specific things are chiropractic, the realism of "reality" tv, whether or not I'll ever be on time for work...I could go on and on, but won't. Just suffice it to say, I lean more toward a scientific explanation for things as opposed to just having faith. 4. What in particular tends to catch you eye and make you want to take a photo? Animals, nature, color. Things that are orange, interesting or funny signs, dogs, unique street lamps, colorful flowers, sunsets, tiny cars. There are a lot of things around L.A. I'd like to photograph. 5. Please name one thing you would like to know how to do but don't YET know how to do. Fix photo flaws, such as a giraffe wound, in Photoshop. 6. What was your first real job and did you like it? Salesperson at a shoe store. I did not like it. I do not like to sell. I would get reprimanded for not being pushy enough. I also worked with some really creepy men there. 7. What one very expensive thing would you like to have but can not justify so you will do without? 8. What one very inexpensive thing has made your life so much better? Berry flavored sparkling water. It is pretty inexpensive at Trader Joe's and is helping me drink a lot less soda. People who are incredibly talented either artistically, professionally or otherwise, but who remain grounded and humble. 10. What are you thinking about doing this weekend? I'm going to the Hollywood Bowl on Friday, working Saturday, and going to watch some kung fu films at a friend's house on Sunday. Other than that, I plan to help Eric get things ready for an upcoming screening, do some household chores and some reading. I TOLD YOU I WOULD SHOW YOU HOW TO FIX THAT GIRAFFE! heeee! send me the picture, i'll see if it's possible before i show you how.